These guides are intended for advanced IT administrators deploying CloudReady in environments with pre-existing mass deployment infrastructure. These guides assume that the reader has previous experience with configuring and using a given mass deployment tool. For organizations planning to install CloudReady on fewer than 100 machines, simply creating multiple USB installers is recommended. These instructions assume that you have already deployed Microsoft Windows Deployment Services (WDS) infrastructure at your site. Be aware that CloudReady comes in both 32-bit and 64-bit variants. Deploying a 64-bit image to a device with 32-bit processor architecture will result in a device that cannot boot and will need re-imaging. CloudReady_WDS_Tools.zip, which contains tools you will need for WDS deployment of CloudReady. A custom CloudReady image for your organization, designed for WDS deployment. The standard installation files available on my.neverware.com will NOT function for mass deployment. Please contact support to have one created for you at no charge. The process will generally take 3 business days or less. A server running Windows Deployment Services. 1. 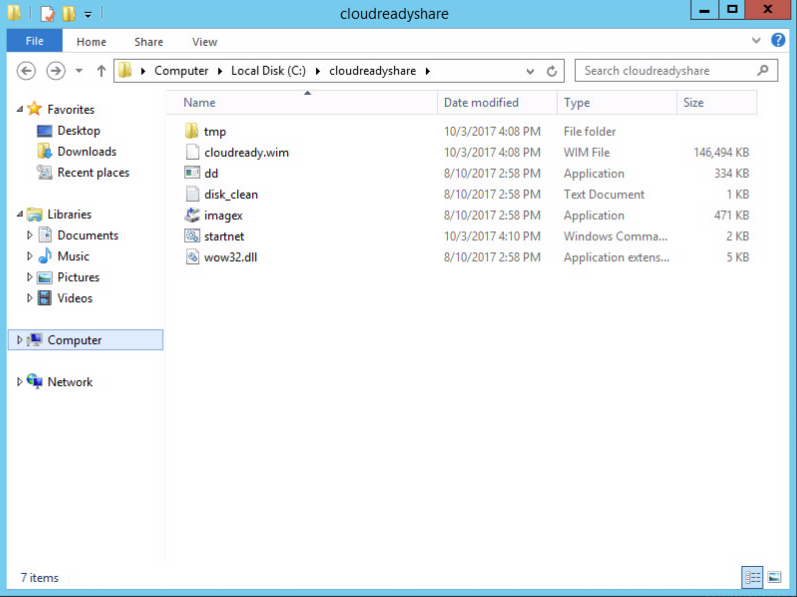 Create a shared network folder on your network and extract the contents of CloudReady_WDS_Tools.zip into it. 2. From the downloads section of my.neverware.com, download the appropriate image for your WDS deployment. 32 and 64 bit deployable images are available in both UEFI and Legacy-boot variants. Please note, deployable images are not present by default - contact our support team to have them created for you. 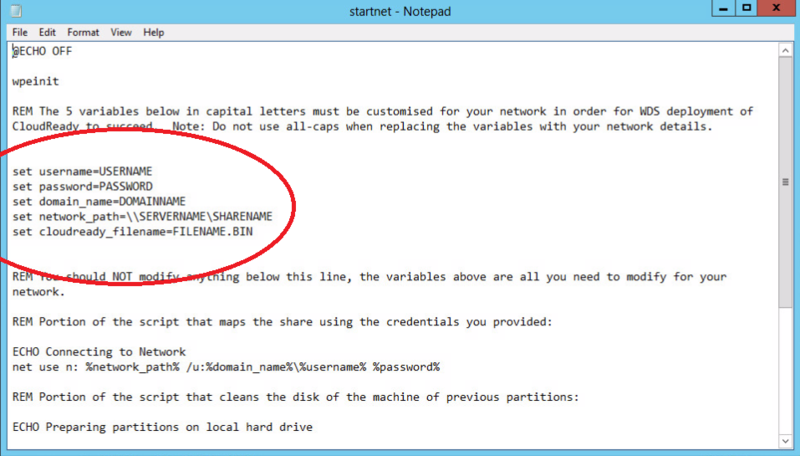 Unzip the large (more than 10GB) .bin file into the same shared network folder. 4. Save the startnet.cmd file. 1. Connect via RDP or another remote access method to the desktop of the server hosting the CloudReady network share. The following commands cannot be executed on a remote network share. 5. Allow for the cloudready.wim file to be mounted. The contents of the cloudready.wim file will be present in the "tmp" subfolder inside the folder containing your CloudCeady files. 6. Using windows file explorer, copy the startnet.cmd file you modified into the windows\system32 folder inside of temp, overwriting the previous file. 7. 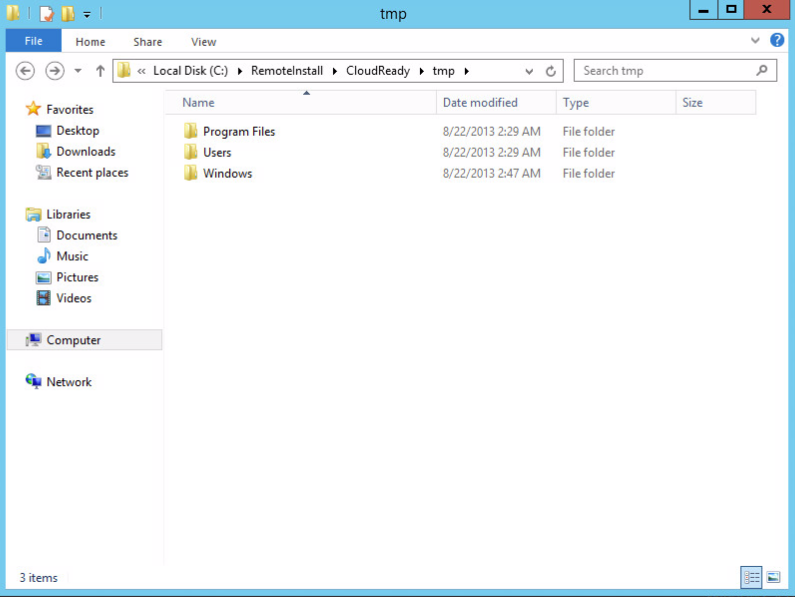 Close any open explorer windows or files accessing the tmp subfolder. The unmount process in the next step is very particular that no files are in use. 9. Allow for the image to become unmounted. The process of editing the boot image is now complete! Expand the server that currently hosts your PXE images. PXE boot a client machine. Select the “CloudReady” boot image from the menu. Deployment will proceed automatically. After deployment the computer will reboot with CloudReady installed. To facilitate large-scale deployments, CloudReady can be deployed using Microsoft System Center Configuration Manager (SCCM). Neverware provides expert guidance, custom SCCM-deployable disk images an an easily importable SCCM task sequence to customers upon request. To discuss deploying CloudReady in your organization using SCCM, please contact our sales team. These instructions assume that you have already deployed Symantec Ghost imaging infrastructure at your site. This document only covers creation of a Ghost image of a drive containing CloudReady, not the subsequent deployment steps, which are the same as for any other image. A “reference” device installed with CloudReady. CloudReady must be installed to storage that is smaller than ANY storage device that CoudReady will be mass deployed onto. Ghost does not have the ability to deploy a CloudReady image onto a storage device smaller than the drive that the image was originally lifted from. An inexpensive 16 or 32GB SSD is useful for this purpose. A bootable USB environment containing the Ghost executable. A fast external USB storage device to hold the image (ie, an SSD connected to a USB dock) of at least 8GB capacity, formatted with an NTFS filesystem. Install CloudReady on a device. Do not boot the device after imaging, as unique data like MAC address is generated on the 1st boot after installation. Insert and boot from a bootable USB containing the Ghost executable. Locate the folder containing the Ghost executable and navigate to it via the DOS or WinPE command line. Type “ghost32.exe -IR -FNF” and press enter. This step tells Ghost to operate in a special “raw” imaging mode that can cope with CloudReady’s non-Windows partitions and filesystem structure. Once you see the Ghost EULA screen, insert the external USB storage device. Navigate to Local>Disk>To Image and press enter. Select the internal drive that Cloudready is installed on, and press enter. Select your external storage device from the file list. This will likely be towards the bottom of the list, and will show up as “[volume label] NTFS drive”. Give the image a name and press enter. Select “High” from the Compress Image dialogue box that appears. In testing, this results in a ~2GB .GHO file. Select yes to the final confirmation dialog box. The process of creating an image will take between 30 and 50 minutes on a laptop with USB 2.0 interfaces. Optional but recommended final step: Using the resulting .GHO file and the Ghost bootable USB stick, select Local>Disk>From Image to install the image to a different piece of hardware. Boot the device to verify that the image file works correctly. This document assumes that you have already deployed FOG infrastructure at your site. A computer to use for CloudReady image capture. This can be any certified CloudReady model. For maximum effectiveness, the hard drive in this device should be as small and fast as possible. CloudReady can be installed on as little as 16GB of storage. A destination computer, to be used for testing the process. This can be any certified CloudReady model. A standard CloudReady USB installer. 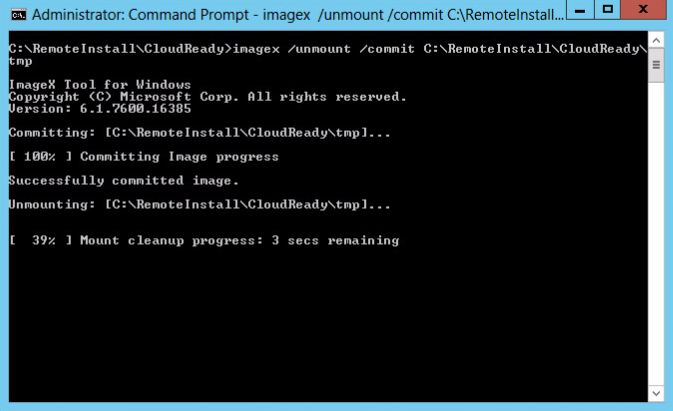 On the image capture machine, install CloudReady. Do not power the computer back on. The image must be captured before first boot. In your FOG management console, go to Image Management and select Create New Image. Enter a description as you see fit. Operating system should be categorized as “Other ­ (99)”. Image path should be unchanged. Go to the Host Management section and locate your image capture computer. Click “edit” for this host. Change the “Host Image” to the image you created for CloudReady. Click “Basic Tasks” under the Host Menu on the left hand side. Select “Upload”. Verify that “Schedule Instant Deployment” is selected. Click “Create upload task for host name”. You will see a confirmation notification. PXE boot the image capture machine that is installed with CloudReady. The capture process is automatic. When the capture is complete, the computer will reboot. You are now able to deploy CloudReady as you would any other OS image in FOG! Verifying on a test machine is recommended before mass deployment.